Home Blog Ready to create your first app? 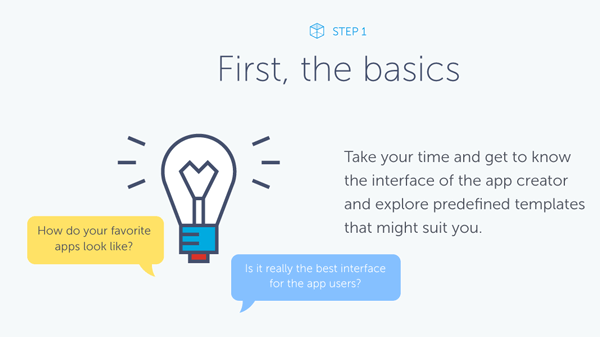 Ready to create your first app? Mobile is not a coming trend anymore – it’s our everyday reality. Smartphones changed our lives in so many ways, but none in as fun and a convenient way as mobile apps. There are over 1.6 million mobile apps with in app stores already. Nowadays, to publish an app for your business, you don’t have to be a developer, we'll show you how to create an app without coding. So, why an app? If you think providing personalized experience and support to your customers would be a good idea, you are on the right track. Your business can benefit from having an app in many ways. The secret is communicating and building a relationship with your former, present and future customers. From providing a follow-up service, notifying them about new stuff and promotions to offering other functionalities that are an extension to the basic service. Creating a mobile app today doesn’t need to be expensive or lengthy. The easiest, quickest and proven way to create an app is using mobile app development software. 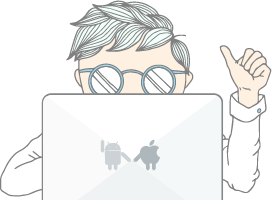 Ask Google for advice – there are several handy platforms and SDKs to discover, which work as WordPress for mobile apps. You can bring together a good combination of services, branding and loyalty to your customers, no matter which business you are into. A good example is the car-servicing industry, where it’s possible to encourage customers to come back, simply reminding them their car needs regular check-ups. Through the app you can also notify them to take advantage of special offers, encouraging them to bring in new customers, rather than sending out newsletters, which often end up in spam. 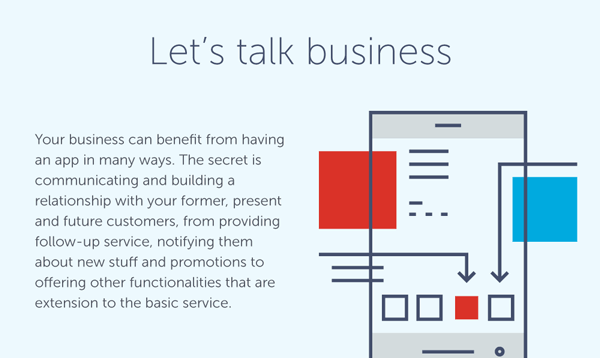 The key is to build long-lasting relationships with your customers directly, along with the fact that in the long run apps provide a more cost-effective way, than traditional means, of communicating. 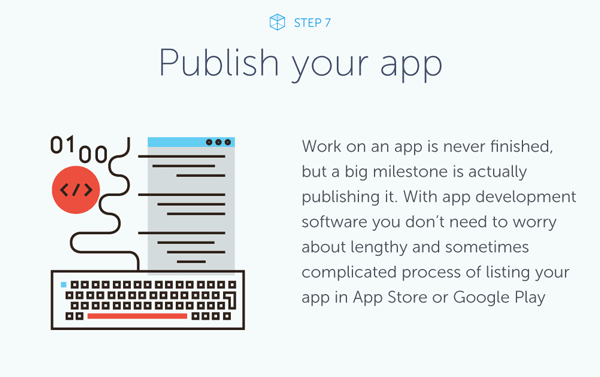 Here are some general rules and ideas to make your first app-building experience much easier. How do your favorite apps look? Is it really the best interface for app users? As soon as you start thinking about it, questions will come up, followed by answers and new ideas and, little by little, your app is becoming a reality! When browsing the app stores, check if there are other apps with the same purpose. Don’t be discouraged when you find out you haven’t thought of a revolutionary idea! Instead try to focus on the features and experience, which will make your app unique, whether it’s within your design or functionalities. Choosing the right name for your app is important for differentiation and recognizability. If the name hasn’t popped out right after the idea for the app itself, try to think about what exactly your app will do, who would use it, and which users you want to attract. 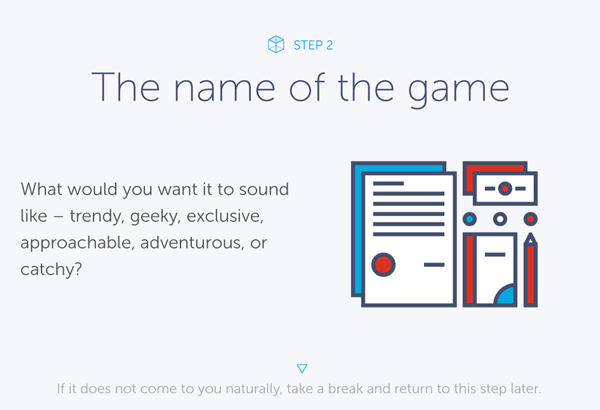 What do you want it to sound like – trendy, geeky, exclusive, approachable, adventurous, or catchy? If it doesn’t come to you naturally, take a break and return to this step later. Very important: check the app stores for same, or similar-sounding, names of apps that might already exist. It’s also a good idea to check the availability of the domain name, as you might need to register it to publish a website for your business as well. 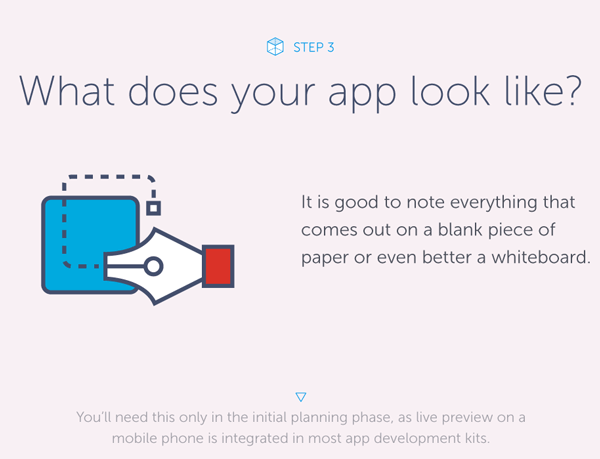 Step 3: What does your app look like? Sketch it on paper first and then start using the app creator. It’s good to note everything that comes out on a blank piece of paper. Even better than a piece of paper is a whiteboard on which you can make changes as you go, get new ideas and test different options. You’ll only need this in the initial planning phase, as a live preview on mobile devices is integrated in most app development kits. You will need photos and graphics for the interface elements. 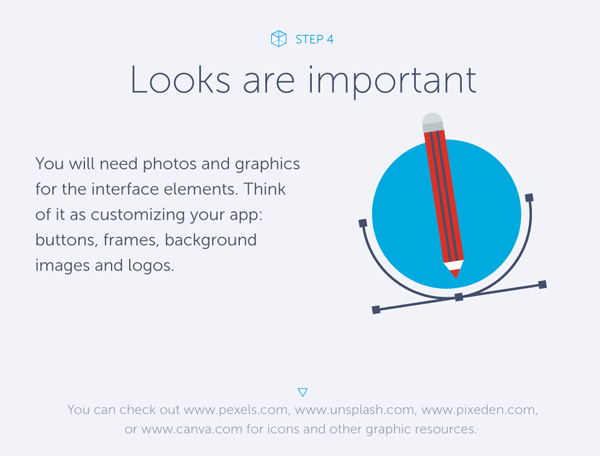 Think of it as customising your app: buttons, frames, background images and logos. Don’t let fancy words scare you: there are free stock image sites that offer these elements to less experienced users. So if you don’t have account on some of the most popular image libraries, you can check out www.pexels.com, www.unsplash.com, www.pixeden.com, or www.canva.com for icons and other graphic resources. Prepare all the texts, links and other written material, such as terms and conditions, beforehand. Proofread the content for the app, as it will be easier to implement once you start making the app. 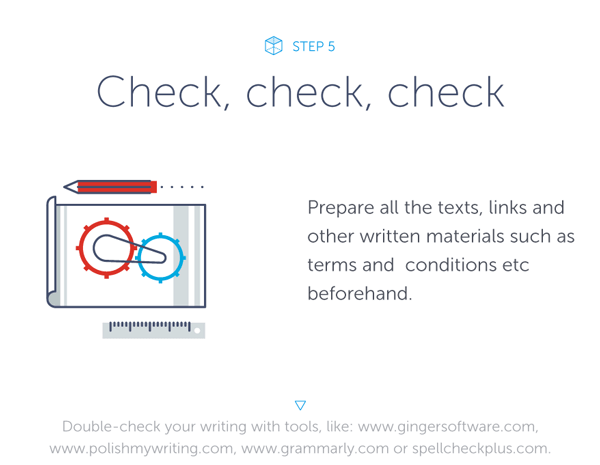 Double-check your writing with tools like: www.gingersoftware.com, www.polishmywriting.com, www.grammarly.com or spellcheckplus.com. With app creators, sometimes you don’t need to input text as it already existing on your website, or blog, and can be imported into the app with just a few clicks. Still, be sure to proofread it before using it in the app. Your app is made for real people. 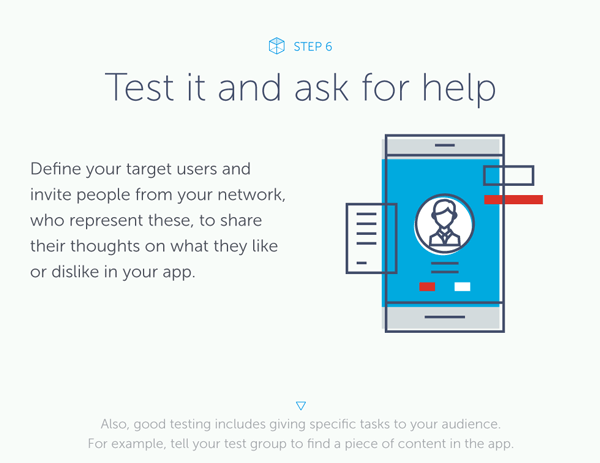 How users will react to your app is actually quite simple to test. Define your target users and invite people from your network, who represent these, to share their thoughts on what they like, or dislike, in your app. It might give you new ideas and insights, as well as put you on the right track if you’ve forgotten anything in the creation process. Also, good testing includes giving specific tasks to your audience. For example, ask your test group to find a piece of content in the app and see how long it takes them What did they have trouble with in the app? How did they go about executing the task? If they had trouble with something, it’s a good indicator that this part of your app may need changing or additional fine-tuning. Work on an app is never finished, but a big milestone is actually publishing it. 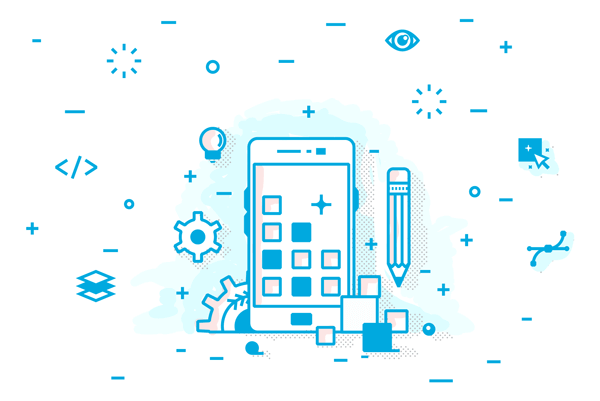 With app development software you don’t need to worry about the lengthy, and sometimes complicated, process of listing your app in App Store or Google Play. App creators do this automatically for you, and the best part is that you don’t need to develop your app for each platform (iOS and Android) separately. Just create your idea in the app maker and the software engine behind it will do everything else for you. Now that you’ve mastered what it takes to create your app, you just have to start and be part of the wonderful world of innovations. A world with many valuable resources at your disposal. I hope you enjoyed this article! Please leave a comment if you have any questions or feedback!